The obvious problem with this form of bankroll strategy is that if you win, the winnings will remain in the video poker balance for the entire hour that you play. This means that, though you could win a lot, you could actually end up spending it all on additional wagers. You could cash out every time you win, but this is not practical and could well break your focus on the game, with negative consequences as a result. One method to counter this if you want to play with 1,000 credits for an hour is to only load 500 credits initially. If you note a winning streak for the entire hour you may not have to transfer any more credits into the game, thus saving yourself 500 credits for the hour. If you run out of money at any point you have two options; either to stop play entirely or to transfer some more credits. For example, if you had 15 minutes remaining, you could inject a further 250 credits into your video poker game. Whilst RTG has some wagering changes for its video poker, Cryptologic has also released a poker format called Over Poker. In normal video poker, you’re able to either discard cards or hold onto them. Upon discarding a card, it is replaced and offers you your final hand. However, in Cryptologic’s Over Poker variation, you’re offered a third card with the ‘Move Up’ feature. During this option, the original card is moved up a level and a new one appears below. Whilst the feature may offer you a better chance of winning, it also costs more to play, and should be used at your indiscretion. The Move Up feature should never be used if the result will weaken your hand at the lower level. If you have a winning combination on the lower cards, then avoid the Move Up feature completely as it’ll not only cost you more to play, but you could significantly damage your chances of winning the round. For example, if you have two lower level queens, then you’re assured of a payout. Moving one of them to the higher level will almost certainly see bad results. There are certain times when the Move Up feature can provide a number of benefits. When you’re starting a new level, generally you will not be weakening a lower level of cards and will be incurring a cost anyway, so the extra Move Up wager could be used. In upper levels, payouts start with Jacks or more, so you should only use the Move Up option if you have a jack, queen, king or ace to start a new level. An alternative use for the Move Up feature is when a new level has already been created. If a lower level is showing no signs of winning, then lifting the card to a new level where there are greater chances of getting a payout can be beneficial. There are certain times however, when this should once again be avoided. If you only have a jack at the higher level, for example, then you could move a 10 up and play for a straight. With three cards left to be dealt, this is not likely however, and so 10’s should be discarded at the lower level. On the other hand, if you have a jack on the upper level and a queen on the lower, the queen should be moved up for the chance of a straight or double queens. Cryptologic’s Over Poker is slightly more complicated than many other video poker titles because of the extra Move Up feature. Whilst this can be beneficial in some cases, and can offer you the chance to increase your winnings considerably, its wrongful use can have a negative impact upon your winnings. And, unless you’re an experienced gamer of video poker, casting the Move Up option aside or avoiding Over Poker altogether, may be the best option. 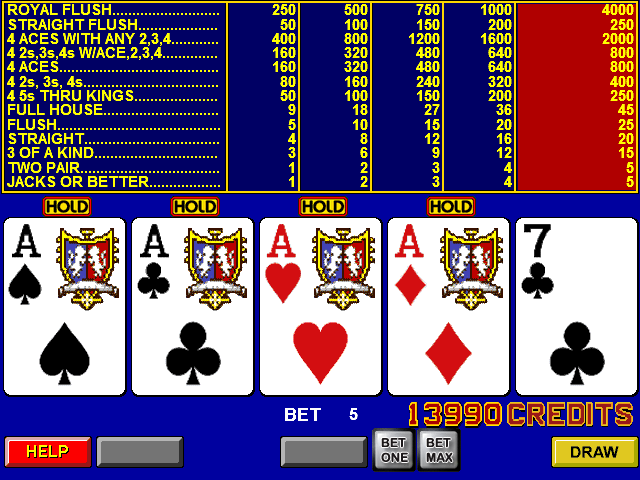 This entry was posted in Video Poker and tagged in Cryptologic, Realtime Gaming.